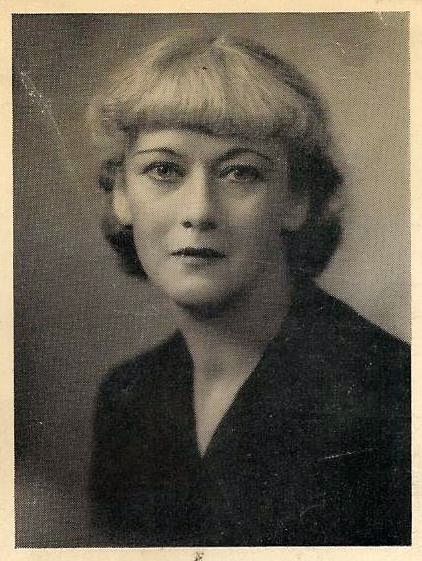 Anita Boutell authored four mystery novels that were published in a creative burst between 1938 and 1942: Death Brings a Storke, Tell Death to Wait, Death Has a Past and Cradled in Fear. 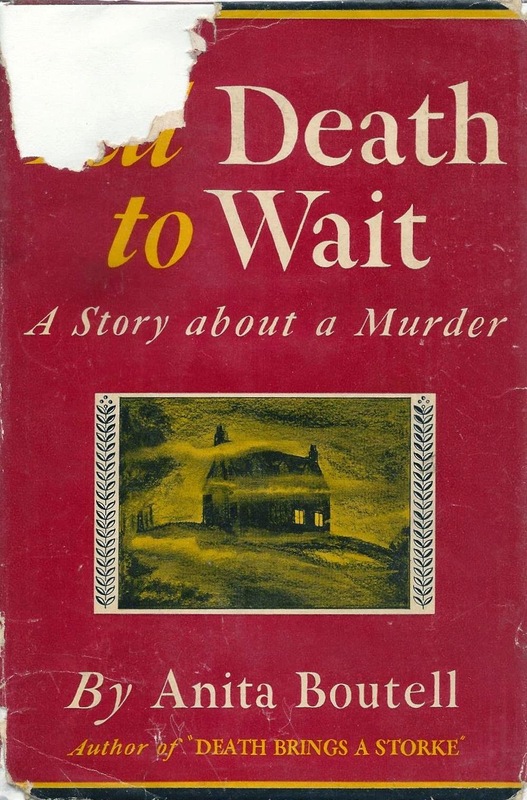 While Boutell's first novel took the form of a classic village mystery with an amateur detective, a Dr. Storke (hence the punning the title), her second, Tell Death to Wait, one of two novels she produced in 1939, broke with Golden Age tradition, being much more a psychological suspense story. Significantly, the book was subtitled not a detective story but, rather, A Story about a Murder. With this book Mrs. Boutell should take a front seat in that select group of mystery authors who, like Dorothy Sayers, can contrive a good plot and who at the same time provide a fine literary style and living characters. I would argue that Tell Death to Wait is more innovative than any mystery by Dorothy L. Sayers (whether it is better or not is another question). In some ways it is reminiscent of--and an improvement upon--Milward Kennedy's innovative 1937 crime novel, I'll be Judge, I'll be Jury (there's even an epigraph from Alice's Adventures in Wonderland). I was also reminded of Anthony Berkeley's brilliant Jumping Jenny (1933). Boutell's novel takes place over one cold November night and early morning at a house party at Wraith's Point, the Cotswolds country cottage of Leo (Leonora) Thane and her much older husband, Godfrey Wellen (known as "G. W."). The guests are a married couple, Richard ("Rickey") Garnett, a fashionable Harley Street doctor, and his wife, Lady Una, daughter of the Earl of Danby, and four singles: Penelope ("Penny") Waring, Ross Fenton, Peter Druce and Nan Orr. The monstrously egocentric Leo has cuckolded G. W. multiple times since their marriage, including with two of their guests this fateful night, Ross, an unwillingly discarded lover, and Rickey, the current one who is trying to break from her, much against her desire. Additionally Leo, a highly successful novelist and literary critic, is writing a novel laying bare myriad fictionalized details from the life of Penny, including her one-night stand with Peter, which Penny believes will ruin her engagement to another man (his straitlaced mama will be mortified, don't you know). Related in this brief fashion it all sounds like a soap opera, yet Boutell carries it off well. Everyone at the house party seemingly has reason to want Leo dead, even, perhaps, her younger, starstruck former friend Nan, who has been taken up again by Leo because she has had a successful book of poetry published. And, indeed, Leo is found dead, exactly one-fifth of the way through the novel. The rest of the story is devoted to a psychological struggle between six of the guests, who insist that Leo's death was an accident, and one guest who knows that it must have been murder--and wants to report it to the police as such. Like Boutell's second book from 1939, Death Has a Past, Tell Death to Wait is a clever contrivance. Barely longer than a novella (I think about 45,000 words) and compulsively narrated by four different characters, it is unquestionably a page-turner that most any mystery fan would feel compelled to finish, I imagine, in one evening. 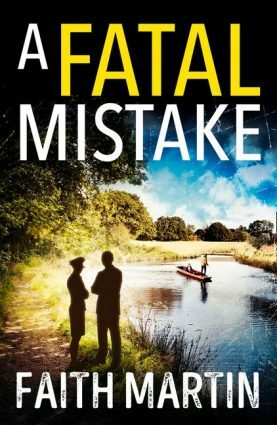 The ending should deliver a punch to most readers and, for those who like murder puzzles, there is even a legitimate problem for readers so inclined to work through to solution. If the characters never emerge as creations as memorable as those of Sayers, they do indeed "live." To me Leo, an impressive portrait in selfishness, was the most alive--even after her death. Anita Boutell's third novel, Death Has a Past, has been reviewed on several blogs, and today is her most available book. Her other titles, though published and praised in both the US and the UK, are rarer. After an interval of three years--during which time both the UK and US were ensnared in worldwide war and Boutell, an American by birth, returned with her husband from England, where she had been living for some time, to the United States--her final novel, Cradled in Fear, appeared. Set in the US and lengthier than her 1939 books, it was marketed as more of a mainstream novel, akin to Daphne du Maurier's Rebecca (1938). This was her last novel, as far as we know. Thanks Curt, I'll be looking out for her. Found a couple on Abebooks! Happy reading! In good news, it looks like a couple of her books are going to be reprinted early next year. Many thanks! A superb essay on what sounds to be a mouthwatering book. Like Peggy Ann, I'm off to scour the online dealers. Thanks so much! Good hunting! I'm hoping all her books may be back in print next year. I am Anita Boutell's Great granddaughter. I am trying to gather as much information about her as I can. She was a fascinating woman and lead a very interesting life. I want to thank you for posting this picture, it is the first one I have seen online, and I have been looking for years! I would truly love it if there is any information about her or her life you would be willing to share please contact me at Meaganbh@gmail.com, use subject Anita Day Boutell to avoid spam.